The rumors are finally true. For some time there have been talks going around that Google is working on its own version of an open source web browser. Finally the wait is over. 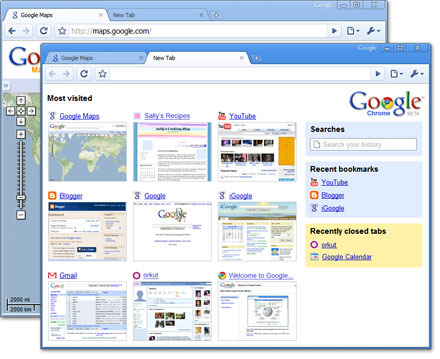 Google Chrome, its open source web browser is all set to debut tomorrow, September 2. Initially the browser will be available for Windows only but there is a very likely possibility that Mac and Linux versions would be made available shortly. Google’s association with Mozilla seems to be paying off. Tabbed browsing is included as a feature but with a twist. Unlike other browsers that offer tabbed browsing, Google Chrome would run each tab as a separate process completely isolated from one another. Each tab runs in its own sandbox and can also be killed individually from the operating system’s process manager. Though this would likely be equal to running different browser windows and hog more memory, one tab crashing will not kill the rest. Google reckons having each tab run as a separate process would ensure greater security. Like other Google applications, the browser sports a spartan interface. Each tab gets its own window controls and users can even tear away tabs into separate browsers if they wish to. APIs are exposed to developers through which the controls appearing on each tab can be manipulated. Private browsing is included and so is an anti-phishing feature. The release of an open source web browser from Google’s stables seems to be inline with the company’s philosophy that believes that the web will be the all-encompassing thing of the future. With this, Google is going after Mozilla Firefox and Microsoft Internet Explorer. Coming from Google we can expect the browser to generate a lot of interest initially. Google in the past had kept its products in beta for very long periods of time. I guess with the browser they would be better served to adopt a more conventional line. Of course there is always the possibility that the browser is just another salvo from Google in its attempt at becoming the Microsoft of the online world. We will just have to wait to find out the truth about this one though. For now ladies and gentlemen, the browser wars are back with a vengeance.